‘Crime and Disease: Contagion by Metaphor’ is my latest article and was published as the second chapter of Criminalizing Contagion: Legal and Ethical Challenges of Disease Transmission and the Criminal Law, edited by Catherine Stanton and Hannah Quirk (Cambridge UP: 2016): 35-54. It bridges medical and legal discourse, tracing the close association through history between the concepts and categories ‘illness’ and ‘crime’ and highlights the extent to which public attitudes and policies are shaped by that association. It draws attention to the way in which an uncritical use of metaphor around both crime and disease contributes to a worrisome tendency towards a collapse of the conceptual boundary between the two. 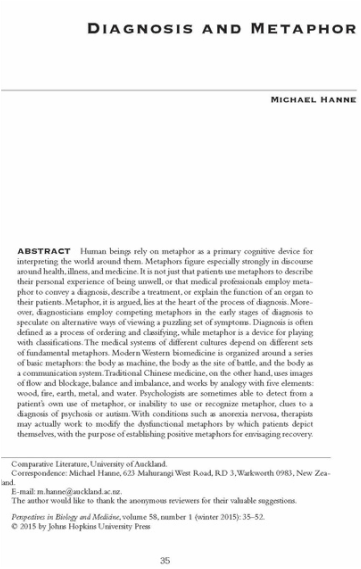 ‘Diagnosis and Metaphor’ is another article examining the role of metaphor in medical discourse, which was published in Perspectives in Biology and Medicine, Winter 2015, 58, 1: 35-52. Metaphor, it is argued, lies at the heart of the process of diagnosis. Diagnosis is often defined as a process of ordering and classifying, and metaphor is a device for playing with classifications. The medical systems of different cultures depend on different sets of fundamental metaphors. Doctors rely on metaphor not only for communicating medical notions to their patients, but for conceptualizing physiology and pathology themselves. Diagnosticians employ competing metaphors in the early stages of diagnosis to speculate on alternative ways of viewing a puzzling set of symptoms. Metaphor features crucially in the explanations doctors offer to their patients of their condition and may even serve as a treatment device for conditions such as anorexia where patients employ dysfunctional metaphors to describe themselves. ‘Metaphors for Illness in Contemporary Media’ is an article I co-wrote with Susan J Hawken, for the journal Medical Humanities 2007, 33: 93-99. This study of feature articles on five diseases – avian flu, cancer, diabetes, heart disease, and HIV/AIDS – published over a 6-month period in the New York Times - revealed distinct patterns of metaphor usage around each disease and highlighted the influence these metaphors may exert on public attitudes to the diseases themselves and to those who experience them. (So, the references to ‘the tsunami of type 2 diabetes’ suggest an inevitability about the occurrence of the disease which is quite misleading.) It calls for journalists and medical professionals to become more aware of the impact of the metaphors they use and to develop sets of metaphors which are factually informative and enhance communication between doctors and their patients. 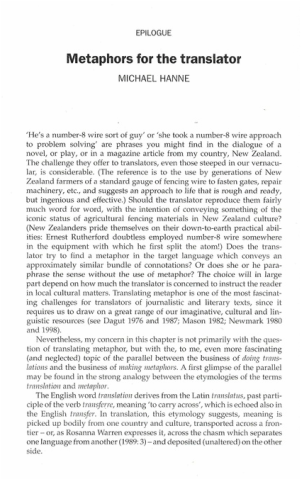 ‘Metaphors for the Translator,’ is the final chapter in Susan Bassnett and Peter Bush’s The Translator as Writer (Continuum: 2006): 207-223. In this article, I explore the fascinating and neglected parallel between the business of doing translations and the business of making metaphors. I catalogue the extraordinarily rich assortment of metaphors employed over time and in different cultures to describe the process of translation. In so doing, I argue that, just as no translation can perfectly convey the sense of the original text in a different language and culture, no single phrase exhausts the metaphorical potential of a person, object or phenomenon. New translations and new metaphors are required to illuminate fresh aspects of the original. ​The Power of the Story: Fiction and Political Change (Berghahn), the book I published in 1995, at the very beginning of my venture into narrative and metaphor studies, examined the grand claims which had been made over the preceding 200 years for the direct social and political effects of certain exceptional novels and other works of narrative fiction, from Ivan Turgenev’s A Sportsman’s Notebook (1852) to Salman Rushdie’s The Satanic Verses (1988). In their crudest forms, such assertions are obviously naive, oversimplifying the complex ways in which literary texts can be said to “work in the world” and oversimplifying, too, the causal processes required to account for a major social or political change. But I draw on: theories of history-as-narrative from Hayden White and others; on arguments from reception theory about the extent to which the “meaning” of a literary text may be constructed differently in different ways by readers in different contexts; and on close study of the instrumental use made by political activists at moments of acute historical stress, to illustrate the complex mechanisms by which they may have contributed to change.